Georgian alphabet. An entry in the ‘Write in Georgian Contest’. Photo from official website of ‘Write in Georgian’. The following is a partner post from EurasiaNet.org  by Monica Ellena . Republished with permission. Dato Dolidze’s fingers move slowly on the old handset as he writes a text message to his son. “My phone only has the Latin alphabet, so every time I text I need to translate the Georgian letters into the Latin. It’s a pain,” says the 50-something orange vendor at a Tbilisi vegetable market. While newer smartphones enable the use of the Georgian alphabet, many in Georgia – where the average wage is $333 a month – are, like Dolidze, stuck with cheaper, older phones. Georgia’s unique alphabet is one of the unintended casualties of such digital compromises. 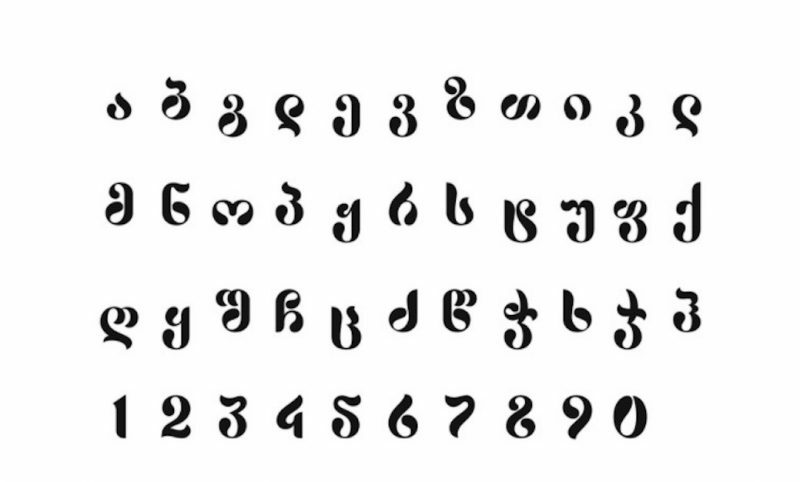 The curvy Georgian alphabet has seduced scholars and calligraphers for centuries, most recently the United Nations Educational, Scientific, and Cultural Organization. Last December, UNESCO included the Georgian alphabet in the organization’s register of the intangible cultural heritage of humanity . The Georgian alphabet is hardly in imminent danger. But it is a linguistic underdog, used only for Georgian and related languages in Georgia like Mingrelian and Svan, spoken by about 3.7 million people, or 0.06 percent of the world population. And with minor languages around the world dying at the rate of one every 14 days , some in Georgia are trying to make sure their language or alphabet is preserved for the long haul. Of the 7,100 languages currently in use worldwide, only 500 are used online while only 348 are supported by Google, the world’s leading search engine, according to a UNESCO report  published in 2015. And even many of those languages that do make it on the Internet have limitations: Georgian, for example, is represented by only a single font on Microsoft Word. As a result of Georgia’s limited online reach, Latin script is often used instead. Retail companies as well as service providers, for example, tend to use the Latin alphabet in their promotional texts. “25% p’asdaklebas akhal ch’amosvlis” instead of “25% ფასდაკლებას ახალ ჩამოსვლის” (25% off on new arrivals). Private initiatives have emerged to bolster Georgia’s web presence. In 2015, industrial designer Zviad Tsikolia teamed up with Georgia’s largest lender, TBC Bank, and launched the contest #WriteinGeorgian, calling on volunteers’ creativity to create new styles for the alphabetic characters. Georgians responded enthusiastically, with 160 new fonts submitted in five weeks. By March, all the fonts will be available on the contest’s website  for open-source download, Tsikolia said. “The future is glocal, global citizens who value national traditions,” notes Tsikolia. “Switching to the Georgian keyboard takes two seconds, but many people cannot be bothered even to do that,” Tsikolia says. Neighboring Armenia faces similar challenges, as it also has a unique language with an alphabet used solely for Armenian. As in Georgia, enthusiasts have taken the initiative. Zohrab Yeganyan, press officer at Armenia’s human rights ombudsman, grew tired of seeing Armenian ill-treated on the web and vented on his Facebook page. “Let’s make February 7 the day to write Armenian on the Internet,” he wrote in a 2012 post. The response was overwhelming, both in Armenia and among the diaspora. “There were people who only spoke Armenian and decided to learn how to write in Armenian, starting with posts on social networks,” Yeganyan told EurasiaNet from Yerevan. Yeganyan said that while the Armenian government has been relatively inactive in supporting the alphabet, there are signs that the private sphere is increasingly embracing it. “Recently one mobile company started sending texts to its customers in the Armenian script, switching from the Latin alphabet,” he said. The popular push has supported the national scripts to become fashionable again, Yeganyan argues, as people have grown to realize that their particular alphabets are uniquely suited to represent the sounds of their language.